Bob Friend was born on Monday, November 24, 1930, in Lafayette, Indiana. 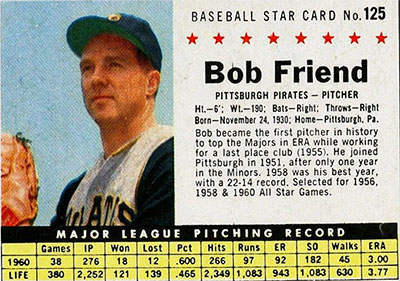 Friend was 20 years old when he broke into the big leagues on April 28, 1951, with the Pittsburgh Pirates. His biographical data, year-by-year hitting stats, fielding stats, pitching stats (where applicable), career totals, uniform numbers, salary data and miscellaneous items-of-interest are presented by Baseball Almanac on this comprehensive Bob Friend baseball stats page. Robert Bartmess Friend was a Major League Baseball player who pitched for the Pittsburgh Pirates New York Yankees ( 1966 ) and New York Mets ( 1966 ). Bob, his nickname, went 14-9 with the last-place 1955 Bucs , his first winning season, and his ERA (2.83) was the best in the Senior Circuit, making "The Warrior" the first twirler to win an ERA Title with a last-place team! 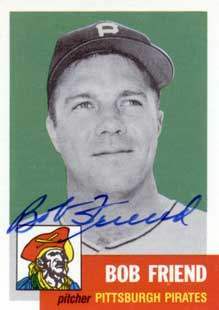 The Bucs had ten losing seasons from 1951 through 1965, finishing in last place five times, and losing 100-or-more games three times, while Bob Friend was with the club. During that time, Friend won ten-or-more games nine times, fifteen-or-more games five times, and a league leading 22 wins in 1958 ( Top 25 )! The very next season, Friend struggled with his weight, led the league in games lost, and said, "The harder I worked, the tougher it became." Fans were upset with the former ace, but Danny Murtaugh ( Pirates Manager , 1957-64, 1967, 1970-71, 1973-76) told the media, "What would you do if a Cadillac broke down? You wouldn't junk it You'd get the trouble fixed. So why should I give up on Bob?" Did you know that Bob Friend holds the all-time Pittsburgh Pirates franchise records for career games started (477), strikeouts (1,682), innings pitched (3,480.1), and totals batters faced (14,644)? His résumé includes a few more team records he might not have wanted, but he holds them nonetheless; most games lost (218), most home runs surrendered (273), most earned runs allowed (1,372), and most hits allowed (3,610). Did you know that Bob Friend once said, "I don't baby my arm. Robin Roberts once told me to keep on throwing and I'd never have trouble with my arm. He was so right. If there's a slight stiffness, I throw it out." The advice given to him by the hall of famer worked for The Warrior - not once in his career did he get sent to the disabled list! In 1966, Bob Friend pitched for both New York teams - the first player in baseball history to take the field for the Yankees and Mets during the same season ! On Baseball Fever , our sister-site, I created a research list of Yankees who were Mets | Mets who were Yankees , for those who want to see every player in history in that particular "club".